Cochin: Cochins originated in China. They’re big, fluffy balls of ­feathers, with feathers covering the feet, and they come in buff, black, white, and partridge colors. These popular show birds are excellent brooding hens and love to raise families. In fact, they’re often used to hatch other breeds’ eggs. Their own eggs are small and creamy tan. Cochins are calm and friendly, but they may be picked on in a flock with active breeds. Polish: Polish chickens are small, silly-looking birds with a floppy crest of feathers that covers their eyes. Their crests may block their vision and make them seem a little shy or stupid, or cause them to be bullied by other chickens. If you’re not showing them, trim their crests so they can see better. Some Polish also have beards. These birds come in several colors: One of the most popular is a black-bodied bird with a white crest. Polish lay small, white eggs that they generally won’t sit on. Old English Game/Modern Game: Both of these breeds were once bred for fighting but are now used for show. People either like or hate the look of these birds. They stand very upright, with long necks and legs and tight, sleek feathers. They come in numerous colors. They’re active and aggressive birds. Modern Games are larger and heavier. Both types lay small white eggs. Old English Games are good brooders and mothers; Modern Games are less so. Appenzeller Spitzhauben: This small, sprightly breed has topknot that often looks like a Mohawk and sports a black-and-white polka dot feather pattern. It has become a great show bird for youth, even though the Switzerland-based breed isn’t officially recognized in many U.S. poultry shows. The birds are fairly good layers of white eggs. Cubalaya: This breed came to us from Cuba in the last century and has both full-sized and bantam chickens. The Cubalaya’s distinguishing feature is its long, flowing tail that it carries very low. In show chicken terms, this type of tail is called a lobster tail. The birds come in a variety of colors. They also lack a spur, the sharp, hooklike structure on the back of a chicken’s leg used for fighting. It’s difficult to find a bird with a good tail — and also hard to then keep that tail in good condition. The birds are fair layers of cream-colored eggs and are calm and friendly, although they do like to fly and they range widely. 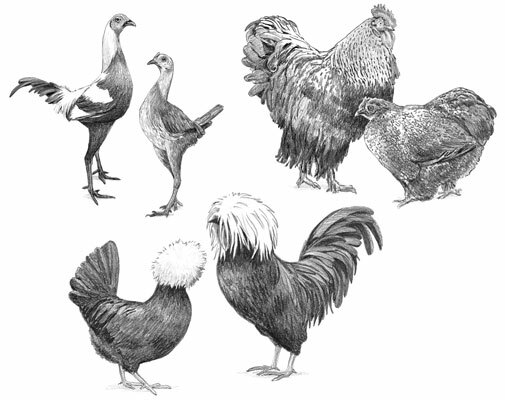 Houdans: The Houdan is an oddity because it has five toes, compared to most chicken breeds that have four. It’s an old breed from France and comes in two colors, white and also black splashed with white, called a mottled Houdan. They also have big, fluffy topknots, similar to the Polish. This type matures quickly and was once used for meat, although it is a smaller bird. It’s a pretty good layer of white eggs. Houdans, like other crested, topknot breeds are often picked on by other types of chickens and seem a little stupid. Trimming the feathers so they can see does wonders. These birds are generally calm and friendly.